Baudelio is well-built and tall, standing at least a foot taller than his master, and with twice his width at the shoulder. His hair is dark, nearly black, and kept cropped close to his head. His eyes are a stark grey, and his mask fragments consist of a small segment of each side of his jaw, each bearing a mandible. Baudelio is taciturn and stubborn. He speaks little to anyone but Aléjandro, and harbours a distrust of Kinezumi's manipulative streak and overly laid-back behaviour. He deeply misses his brother, Carlos, and has a deep desire for revenge on the shinigami who killed him. To keep this possible tactical problem out of the way, Aléjandro usually leaves Baudelio on library desk duty, much to the Fracción's disgruntlement. Escarabajo, the Spanish for "beetle". Baudelio's sword takes the shape of a short, blunt-ended blade more like a meat cleaver than a sword. It is kept sheathed in an equally broad scabbard just below the small of his back. "A cero, Escarabajo!" - Scratch out! Beetle! Upon releasing, Baudelio grows massively (being now about thirty feet wide at the shoulder), resembling nothing so much as this, albeit with a white and black colour scheme rather than purple and gold. His face remains visible under his new form's horn, but now his mask mandibles move as though alive. His already impressive physical strength and toughness also increase dramatically, but his speed drops notably. Whilst released, Baudelio's reiatsu not only increases, it also increases massively in its density. Those within sixty feet of him will find their speed reduced by about 10%, with relatively weaker enemies finding their speeds dropping even more. To those effected, it feels like trying to move through quicksand. Baudelio charges up a bala in each claw, and then slams them into the ground. A flurry of over-large bala then extend outward from the points of impact in an irregular, but overall straight, line. Those hit by these bala will find themselves flung skyward, in addition to the regular damage. 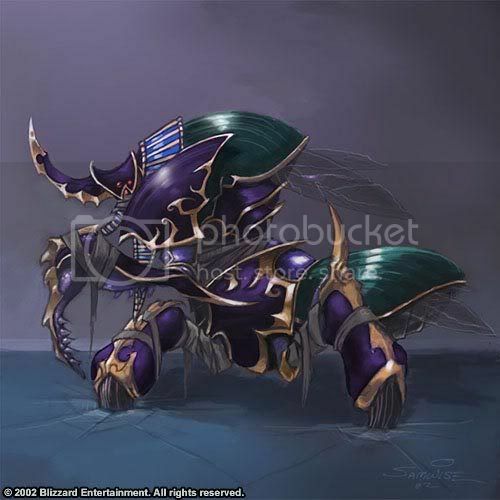 A large number of iron-hard spikes lie under the carapaces on Baudelio's back. Normally, they remain sub-dermal, but if an opponent approaches form behind, Baudelio can extend the spines at sonido-level speed, impaling anyone too close.